In my role as a writer and editor at the University of New Hampshire, I have produced a number of development and engagement pieces for the university’s advancement and alumni relations teams—donor profiles, appeal letters, stewardship pieces, and more. Emily Mallard ’17 grew up loving horses. Today, her favorite place on campus is the UNH barn, where she spends a lot of time riding and working among the stalls, comforted by the familiar fragrance of earth and hay. Here, in the quiet of the barn, she feels especially close to her mom, who died last spring, but always supported her passion for horses. Without her mom, Emily, who was raised in a single-parent household, turned to her two older brothers for support as she looked ahead to college. She had her heart set on the equine program at UNH. But now she wasn’t so sure. Could she do it alone? The UNH4U scholarship Emily received—$5,000 each year for four years—was not only a huge relief, it was a vote of confidence just when she needed it most. “I was thrilled to provide a scholarship that offers peace of mind, one that supports a student during all four years,” says donor Marcia Bennett, who sees the scholarship as an especially fitting way to honor her late husband, Fred Bennett ’54, who began his career as director of UNH’s alumni fund in 1956 and went on to spend 45 years in fundraising. He was a man who understood the power of philanthropy—and the difference it can make. UNH4U Scholarships give deserving students like Emily a chance at a college education. We hope you’ll join Marcia Bennett and become part of our UNH4U team of donors. Your contribution of $5,000 a year over the next four years can make a lasting impact, one that starts right now—with a single student, a hard-earned college degree, and, thanks to your generosity, a future full of possibility. Brian and Jessica are just two of the voices helping to tell the UNH story, a story made possible in part by your generosity. Many of you may have heard these students speak at this year’s University Day. But there are countless others—many of whom are the first in their families to attend college—echoing their appreciation, students who owe their UNH experience to you. Your support has funded textbooks and laboratory equipment, too, as well as faculty research designed to improve lives both here in New Hampshire and beyond state borders. This is the power of philanthropy—the power of The UNH Fund, which can put your contributions to work immediately where they are needed most. Your philanthropy already has set an example for others. 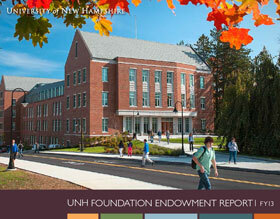 I hope you’ll join us again this year with a leadership gift to The UNH Fund. Thank you for believing enough to give. Thank you so much for your recent gift to The UNH Fund. For many of our students—some of whom are the first in their families to attend college, higher education is only possible thanks to contributions like yours. Your generosity helps to fund textbooks and laboratory equipment, too, as well as faculty research designed to improve lives here in New Hampshire and beyond state borders. This is the power of philanthropy—the power of The UNH Fund, which can put your contributions to work immediately, wherever they’re needed most. Your belief in UNH—and all the good work underway at this university—helps to power the teaching, research, and outreach that define our mission, helps us to send off graduates who are determined to change the world for the better. Lucky for us, you do, too. People like you and Jay McSharry—and so many other alumni and friends—make all the difference to our success. On behalf of everyone here at UNH, thank you for your support. Can it really be 48 years since we graduated? It doesn’t seem so long ago that we were embarking on our freshman year! And then, in a flash, it was 1965 and we were graduating, leaving UNH behind, but carrying with us cherished memories, prized friendships, and a wonderful educational foundation on which to build our future. Now, nearly half a century later, we’re approaching our golden anniversary. Reunion is a great time for giving back, a wonderful opportunity to participate in the tradition of meaningful support that has done so much to enhance the education of tens of thousands of UNH students. Thanks in part to alumni generosity, the University of New Hampshire continues its longstanding commitment to excellence. As volunteers and supporters, we hope you’ll join us in making a contribution and helping us to honor this 50th Reunion milestone. It will take everyone’s support to reach our five-year goal of $1,965,000 by reunion weekend in June 2015. Gifts made since January 2010 currently amount to $340,000—a great beginning! No matter how you choose to give—cash, securities, IRA, life insurance, trusts, estate plans, endowed funds—your donation will be counted as part of our 50th Reunion gift. Another option, a charitable gift annuity, provides a fixed, stable income for life. (The annuity rate for our age group is a generous 5.3 percent or higher.) Of course, you can always give to The UNH Fund, too, which provides immediate assistance to students, teachers, and programs, going to work wherever it’s needed most. If you’ve been giving to UNH through the years, thank you! We so appreciate your generosity. If you haven’t made a contribution recently, we hope you’ll consider one, before our 50th Reunion. More than a celebration of our time at UNH, our reunion is an opportunity to make a permanent gift to future generations. We hope you’ll join us!